Follow 1-15 North to Brigham City. Take Exit 362 (1100 South) into Brigham City and take the right fork of the exit. This will put you on Highway 89. After you get off I-15 you will see a Wal-Mart on the right side of the road. You are on the correct road. As you come down out of the canyon (called Sardine Canyon) you will see the whole valley and it is a beautiful view. Stay on Highway 89/91 and you will pass a Burger King in Wellsville on the left side of the road. Along the Highway 89/91, between mile markers 20 and 21, you will pass a small gas station and a small repair shop called Ted’s. At this point, you will want to be in the right lane of Highway 89/91. In Nibley, you will pass a sign that drops the speed limit down to 55 miles per hour. The next available road to turn right onto will be 2300 South. It is also called Nibley Heritage Drive. Take this right and the road will curve and you will pass some condominium style warehouses. The road will curve back toward the east and you will see 1350 West to your right. This is a Private Road, so you will not find it on Google Maps. If you look to the South, you will see two big brown buildings. We are in the building on the east side of the road. If you are coming from Idaho, we recommend using Airport Road to drop down to 1000 West to escape downtown traffic, but if you are only familiar with Main Street, use it and you won’t get lost. Our address is 2490 South 1350 West. This address is actually easy to find, even though the instructions make it seem harder! If you would rather have our latitude and longitude for a GPS unit, we are at latitude: 41.687826 longitude: -111.865160. I’m hoping we can get signs up on the outside of our building quickly. As soon as we have signs, I’ll post a picture for everyone to see. I have also included a PDF map for you to print when you come visit us! Click here to download the map. 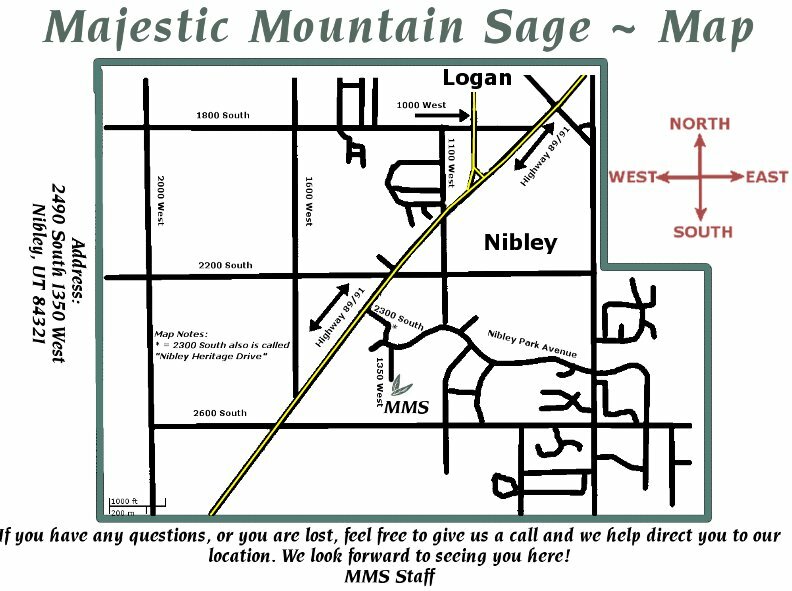 Pingback: Adventures With The Sage » Blog Archive » Where is Majestic Mountain Sage?